Home / Adviart Blog / Just do it! Just do it! Do or die. The idea of nothing novel coming to mind when the adviarter designed the shell intrigues me. Then again, this is the first adviarter who took over one hour to complete the adviart due to an obsession with sand on a table and was also the only adviarter to think about the placement of the shell within a piece of driftwood. Such a different approach–more multidisciplinary and definitely the largest installation that we have the adviart collection. 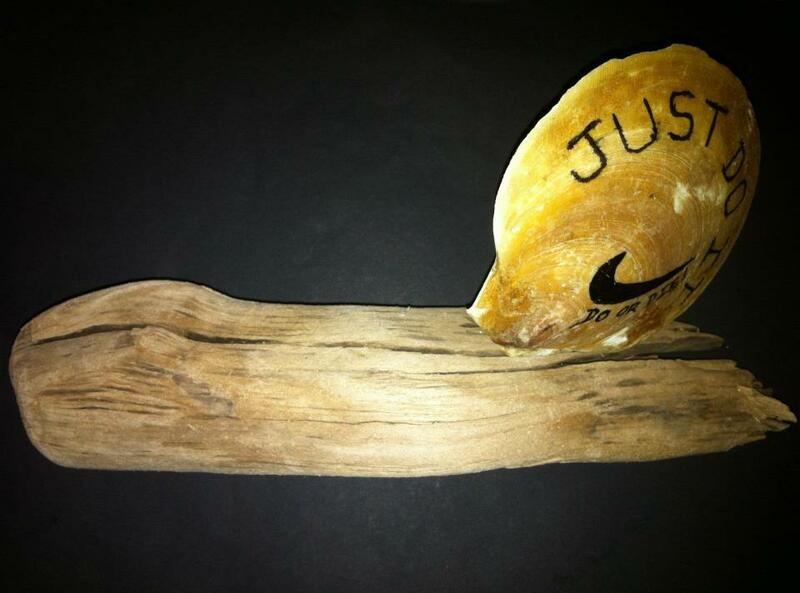 The shell sits delicately within the larger driftwood–the blending of different worlds. Go big or go home. The shell is designed with bold, capital letters–all in black. There is simplicity in the advice–and a sense of immediacy in it as well with the “!”. There are few shells with punctuation. There are also few shells to date that attribute the advice to its original brand or owner. In this case–the brand is Nike. How can we live life by the advice of “Just Do It! Do or die.” It is easier said than done but when we go after what we want, we have no excuses. Does the adviarter mean that you die as a person without doing? Where does this perspective come from? Perhaps there is merit to the idea of just doing it–especially for the overly-analytical who can get easily stuck in reinventing analysis and never getting to the “do”. So should I be worried by the over emphasis of the word “do”. I do think so. The “do” is ironic, isn’t it?